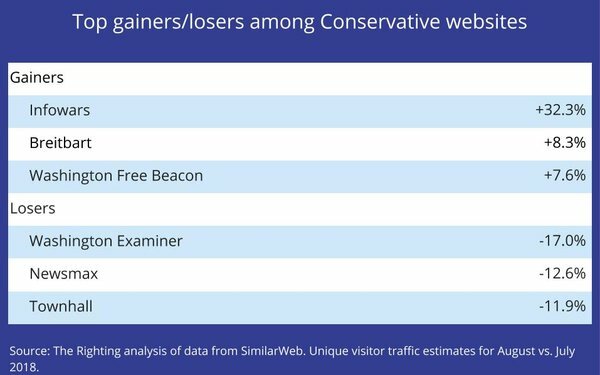 Despite -- or maybe because of -- being blacklisted from the major social media platforms, traffic to Alex Jones’ Infowars.com spiked in August, according to an analysis of monthly visitor data to major conservative websites released this morning by watchdog The Righting. Infowars site traffic surged by a third in August vs. July, representing the largest gain of any leading conservative site, according to The Righting President Howard Polskin. He said September data will be “key” to determining whether Infowars spike is a sustainable trend.